Alberta Heartland is once more preparing for the Regional Contest in Surrey B.C. It's early this year, so we are at camp He Ho Ha with our fabulous coach Queen Anne Downton, in February. This is an annual event for the chorus. For two days we are on retreat,removed from our day to day lives. It was minus 37 on Saturday morning, but we were sparkling in the warmth of friendship and music. Led by Anne, director Lisa and the choreography team of Dineke and Tina, we made the rafters ring. After two days of intense coaching, we were able to relax on Saturday evening. Mosiac Blend quartet hosted an entertaining skit night. Games, music, food and fun kept us all laughing and singing until the wee hours. Alberta Heartland Chorus returned from 2018 contest very pleased and proud of their accomplishments. With an improved score, and a fifth place medal we felt that we had met our goal to be the best we could be. After a year of coaching, rehearsing, and building our craft every member contributed to our success. There were a few glitches on the weekend. A new outlet centre opening right in front of the airport may have caused a delay or two. A last minute change in hotel rooms meant our two competing quartets had to move down the street to a different hotel. And of course a strike at the Sheraton topped it all off. But all was overcome by being flexible and focussing on why we were there. It was open invitation to come and learn about a cappella music. In spite of the cold, and the rain, it was a fun night, full of music, friendship and socializing. Old friends, and new were welcomed with hugs and smiles. They learned a 'tag', and some new moves. They listened to the chorus working on the new repertoire and were entertained with a variety of Christmas songs. It was truly an night to remember. Do you love to sing? Love to hear those chords ring? 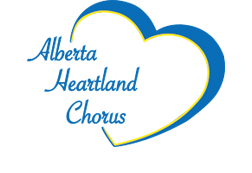 Come and visit Alberta Heartland Chorus on any Tuesday evening from 6:30 to 9:30 p.m. Just ring the bell to be allowed in. You will meet new friends and be introduced to the barbershop art form by an award winning chorus. You can watch and hear our 2018 contest package on YouTube!